Ford’s new Focus ST will be available for both purchase and lease as from June this year and looks set to deliver incredible cabin technology, advanced safety features and excellent performance. The upgraded, turbocharged eco boost 2.0-litre engine boasts the potential to produce 250PS, is capable of returning 39.2mpg and has 20 per cent lower CO2 emissions. The stylish and high performing Focus ST will be available in two body styles: hatchback and estate, with three available trim levels. Other features will include; a unique suspension, high-performance brakes, striking central exhaust and a trapezoidal front grille. The car promises unexampled comfort, convenience and safety with specification to include recaro seats, Ford power keyless start, Bluetooth connectivity, DAB radio and 18’’ alloy wheels. The ST uses the Microsoft Windows Embedded Auto software platform to provide highly advanced information, entertainment and communication functions for the driver and passengers alike and also has one of the most comprehensive voice-command systems on the market. The car will execute just about any of the functions supported by the infotainment system when the voice-command button is hit and a command is given. Pretty impressive stuff! Ford have leapt forward in heaps and bounds with cabin technology, advanced safety features, voice-activated everything and in-car internet access. Ford say the 2012 Focus is the most important car since the Model T hit the roads in1908. 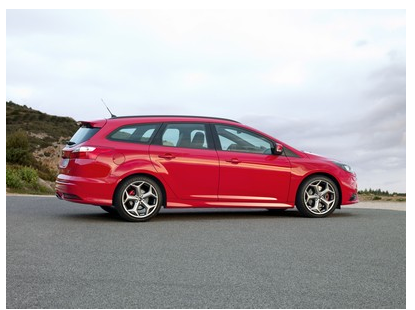 Keenly priced too, the Focus ST looks to be a real winner no matter which way we look at it. If you’re looking to lease a new Ford contact our sales team. Alternatively, visit our website where you will find new and used Ford’s available for sale or on finance.